A book that will change the way you think about technology and business strategy, Does IT Matter? 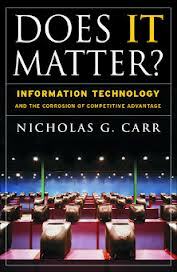 Information Technology and the Corrosion of Competitive Advantage expands and extends the arguments in Nicholas Carr’s explosive Harvard Business Review article “IT Doesn’t Matter.” Does IT Matter? explains how technological, economic, and competitive forces are combining to transform the role information technology plays in business, with profound implications for IT management and investment as well as strategy and organization. Drawing on rich historical and contemporary examples, Carr’s seminal book lays bare the romantic myths that have come to surround computer hardware, software, and networks, and it provides practical advice for how companies can capitalize on the commoditization of IT.